On this very special day, the Lord Jesus calls you and me his friends. What joy that should bring to all of us – to be the friends of Jesus. What a precious gift friendship is. We may have many acquaintances but only a few really good friends. Jesus is truly our friend: he loves us with an infinite, merciful, and self-giving love. The Son of God has gone to great lengths to win our friendship. He assumed our humanity, bore our burdens, and nailed them to the Cross. In our humanity, he rose from the dead and ascended into heaven, giving redeemed human nature a place at the right hand of the Father. And it is Jesus, not ourselves, who takes the first step in making us his friends: “It was not you who chose me but I who chose you, to go forth and bear fruit.” In Baptism, the Lord has drawn near to us and has given each of us a vocation to love, a vocation that becomes specific when we have the discerning heart of a disciple. Dear brothers so soon to be ordained: Some years ago, you and your wives embraced the Lord’s call to marriage and family. The Lord blessed your love for one another and made it a living sign of his love for the Church. Your homes became a domestic church where the faith was taught, lived and passed on wholeheartedly to your children. Your homes radiated Christ’s love to all, especially to the poor and needy. You participated generously in the life and mission of your parishes… always with minds and hearts open to the will of God. After careful discernment, the Church now calls you to a new vocation, a vocation to the permanent diaconate, a vocation within a vocation, one might say. With the consent of your wives and families, you were formed for this ministry and now you are here to be ordained. It has been quite a journey for you and your family. As you take this step, I hope you are convinced that you are the friends of Jesus. What does it mean, dear brothers, when the Lord says to you on this, your ordination day, “You are my friends”? Does it not mean that by the prayer of the Church and the laying on of my hands the Spirit of the Lord will come upon you and imprint on your inmost being a new likeness to Christ, that of Christ the Servant? Does not your friendship with Jesus take on a new dimension and depth such that you will be a sacramental sign of Christ’s self-giving love? This is both a great gift and a responsibility. The permanent change wrought in you by diaconal ordination not only authorizes you to minister as deacons but will remain as an inner conduit for the strength and grace you need to serve as Jesus did, generously and lovingly. How important that you keep this channel of grace and strength wide open through meditation, prayerful reading of Scripture, spiritual direction, and the frequent and worthy reception of the Sacrament of Reconciliation. Growth in friendship with Jesus means you will fulfill your ministry not in a minimal and grudging way but in a free and wholehearted way. What about Jeremiah’s first excuse, “I know not how to speak”? This will haunt us when we’re trying to write a homily after a long week at work or trying to figure out how to share the faith with people of differing cultures. When we meet with people who have left the Church or given up on God then we may find ourselves saying, “I know not how to speak!” Notice that God did not dispute Jeremiah’s claim, “I know not how to speak”. Instead, he made up for Jeremiah’s deficiency: “See, I place my words in your mouth!” In saying this, God did not give Jeremiah an excuse to ramble in the pulpit, or to preach a canned homily or to share his private opinions with a waiting world. Jeremiah had to wrestle with God’s Word and make it his own, and so do we. If we are the friends of Jesus we’ll have the courage to pray over God’s Word to study it, let it challenge us, and let it change us, so we may preach and bear witness to the Word with credibility and effectiveness. If we are the friends of Jesus, the Word we preach will flow into people’s hearts because what we have to say to them is what we have in our hearts. The second facet of your ministry is to serve the Church’s sacramental worship – assisting in the Church’s Eucharistic liturgy by proclaiming the Gospel, leading the General Intercessions, assisting at the altar, and distributing the Body and Blood of Christ. You will baptize, conduct liturgies of the Word, and preside at weddings and funerals. Indeed, for most parishioners, your role in the Church’s sacramental worship will be the public face of your ministry as ordained deacons. Here too we are to manifest the beautiful truth that Jesus has called us his friends. We do this by fulfilling our role in the Church’s public prayer in such manner that we call attention to Christ and not to ourselves. God’s People don’t benefit from gimmicks or theatrics but rather from a prayerful and reverent execution of our roles in the liturgy that bespeak Jesus’ love for his people & our love for Jesus, the Risen & Exalted One. 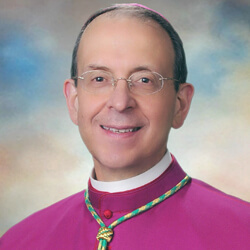 The Church’s prescriptions for celebrating the liturgy should be second nature to us so that when we are engaged in the Church’s sacramental worship, we can truly focus on drawing those we serve into the mystery of Christ’s love, there to experience his mercy and healing, there to be nourished and strengthened so that all of us, clergy and laity, can truly be and become missionary disciples. How important that we pray before we celebrate and while we celebrate, so that our lives may give God glory after we have celebrated. The final component of the diaconal ministry is charity which, in the Acts of the Apostles is described as waiting on tables. Your role at the heavenly table prepares you to set an earthly table for those in need. Charity is not an appendage to your ministry but really is at its core. You proclaim the Word and minister at the altar so that you can serve the poor. And in serving the poor, you truly show yourselves to be the friends of Jesus for he told us that whatever we do for those in need we do for him. When we have recognized the face of Jesus in the poor and vulnerable then we will know that our friendship with Jesus is real. There can be no doubt that Jesus is with us in the poor and disadvantaged – in this City of Baltimore and in all the counties that make up this local Church. You are not the only provides of charity and social services but your ministry is to help everyone in the Church to make the connection between what we believe and how we worship with our service to the poor. In a phrase, you are to practice a charity that evangelizes. As we now enter upon the Rite of Ordination, I join with everyone here, especially your wives and your families, in praying that your friendship with the Lord will continue to deepen and that your ministry as deacons will bear the abundant fruit of God’s love for the Church and for the world. May God bless us and keep us in His love.